Manual - We Wrote The Book On Heat Exchanger Repairs | Heat Exchanger Experts Inc. This heat exchanger handbook will broaden your understanding of how defects occur in furnace heat exchangers, and will enable you to accurately assess the integrity of any furnace. You will be led through the steps to identify defects, according to the history of metal failure in a variety of commonly used residential furnaces, and guided through the steps and techniques required to conduct furnace heat exchanger maintenance and evaluations. The Heat Exchanger Experts Manual will prove to be invaluable for seasoned technicians, novice technicians and everyone in between. It is designed to fit in your toolbox or glove compartment of your vehicle. You can purchase the manual, our inspection mirrors, and other HEE products and gear. Take this seminar very seriously. The public relies on the utility companies more than they rely on any private company to check their residential furnaces for safety and, therefore, need to bear a great responsibility and adhere to high-standards. It is extremely important to be fully trained on the proper techniques to use when checking all brands of furnaces and heat exchangers. Very few inspectors are properly trained in assessing a furnace heat exchanger, and the liability involved makes misdiagnosing a furnace a great risk. However, this seminar will teach you everything you need to know about diagnosing any furnace. You will be able to rely on yourself for furnace evaluations, and therefore, enjoy increased profits and reduced liability immediately. 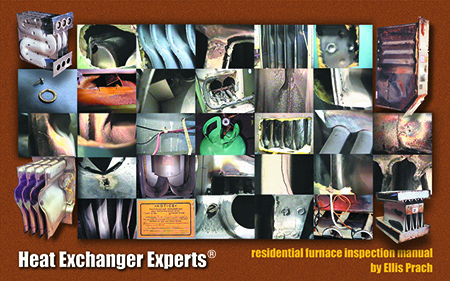 Our goal is to help you cover every type of furnace heat exchanger.